A complete description of the existing widgets is available. EasyGUI_Qt will not have all the same widgets available as the original EasyGUI. While the current version number is 0.4, it is, in fact, nearly complete. I have written a roadmap indicating what's left to be done until the 1.0 release. Anyone should feel free to make comments about the proposed roadmap including making suggestions for additional widgets (with justification provided). 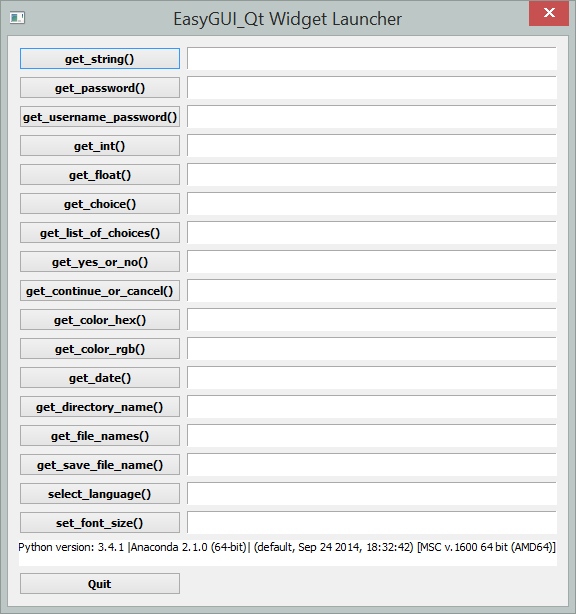 EasyGUI_Qt targets Python 3.3 (and PyQt4) but should support (except for some pesky unicode issues) Python 2.7 - following some requests by users. Disclaimer: following a post on Google+ by a Packt representative, I volunteered to do a review of IPython Notebook Essentials and got a free copy as an ebook (I used the pdf format). The verdict: Not recommended in its current state. IPython Notebook Essentials starts very well. It suggests to use the Anaconda 3.4 distribution (which I have on my computer - more on that later) or connecting online using Wakari. Both methods worked fine for simple examples. which are, ironically enough, in bold in the text as the author wants us to focus our attention on their meaning (but no mention of the error in formatting). While I usually prefer holding a paper book over reading an ebook on my screen, I must admit that being able to copy-paste code samples beats having to retype everything. So, it was possible to quickly reproduce the examples by copy-pasting and fixing the typos to run the examples. However, a much better way exists which is often used by Packt books: making code samples available for download. The IPython notebooks have been designed for easy sharing. Here, the author has chosen not to make use of this. This, in my opinion, is something that is a major flaw in this case. Chapter 2 covers in more details the notebook interface. This is undoubtably the most important chapter of the book for anyone who wishes to learn about the IPython notebook. It covers a lot of grounds. Python programmers will immediately recognize this as being a Python 2 example. However, as far as I could tell (using ctrl-f "python 2") there isn't a single mention anywhere that Python 2 is used. I happened to have the Anaconda 3.4 distribution installed (as recommended) but with Python 3.4 and not Python 2. Python 3 is now 6 years old and there is no excuse to focus on an old, and soon to be obsolete, version of Python without at least mentioning why that choice was made. Minor syntax difference, like adding parentheses for print statements, are easily fixed; some more subtle ones are not. Furthermore, while I had the Anaconda distribution installed, I was still using the online Wakari site to work through the examples, so that was not a major problem at that point. While still in chapter 2, we are invited to replace "%pylab inline" by "%pylab" and run an example again to see a plot appear in a window (I first assumed a separate browser window) instead of being shown in the document. This does not work using the online Wakari site: the window is actually a Qt window, not something that works in a browser. So, to try this example, I had to start my local version and recopy the code, which worked correctly. Shortly thereafter, we are introduced to more "magic" methods and invited to try running a cython example, loading from a local file. This did not work. The recommended "%%cython" magic method is no longer working in the latest IPython version included with the Python 3.4 Anaconda 3.4 distribution. After a while, I found the proper way to run cython code with the latest version BUT the example provided raised a (numpy-related?) syntax error. I copy-pasted the code from my browser to the Wakari online version and it worked correctly, confirming that I had not made an error in reproducing the code given by the author. However, I was not able to figure out the source of the error using the local version. After finishing Chapter 2, I stopped trying to run every single examples and simply skimmed the book. Chapter 3 focuses on producing plots with matplotlib, including animations. While not specific to the IPython notebook, this topic felt like an appropriate one to cover. In Chapter 4, we learn about the pandas library which has very little to do with the IPython notebook. The situation is similar with Chapter 5 which covers SciPy, Numba and NumbaPro, again three libraries that have very little to do with the notebook as such. The choice of NumbaPro struck me as a bit odd since it is a commercial product. True enough, it can be tried for free - however, it is not something that I would consider to be an "essential" for the IPython notebook. I know very little more about the IPython notebook than what I have learned from this book. However, I do know that it is possible to write extensions for the IPython notebook which is something that I would have thought should be included in any book titled "IPython Notebook Essentials", well before discussing specialized libraries such as Pandas, SciPy, Numba and NumbaPro. There might very well be other topics more notebook specific that should be included, but I have no way to know from this book. in Chapter 2, the author seems to assume, and rightly so in my opinion, that the reader will be familiar with Python. However, the appendix only covers the standard Python construct that one may find in a beginner's book intended for programmers that are familiar with other languages. As such, the Python review appendix seems just like a filler, increasing the page count while adding nothing of value to the book. Thankfully, it is relegated to an appendix instead of being inserted in an early chapter. In summary, about half of the book contains information of value for someone who wants to learn about the IPython notebook itself; the choice of Python 2 over Python 3 is odd, and almost inexcusable given that it is not even mentioned anywhere; the lack of downloable code samples" (mostly IPython notebooks in this case) greatly reduces the value of this book and is something that could be remedied by the author. In fact, given the typos mentioned (where variable names are split over two lines), downloadable copies of notebooks should be made available. As I write this review, Packt is having a sale during which ebooks are available for $5. At that price, I would say that IPython Notebook Essentials is worth it if one wants to learn about the IPython Notebook; however, based on a quick scan of other Packt books covering the IPython notebook, I believe that better choices exist from the same editor. It did not support the other ways to use an import statement in Python (see below for an example). Another problem I had is that, once a module is imported, future import statements for that module make use of the cached version. If the programmer modifies the code in their library (tab), the corresponding module needs to be reloaded. I need for this to be done automatically, without the programmer having to do anything special. One solution to these problems might have been to create a special importer class that could import code directly from the library tab and add it to sys.meta_path. Then, after a program has been run, remove all traces of the imported module (user's library) so that the next time it is executed, the import takes place all over again. lang_import: something like "from reeborg_en import *"
In the above, highlight refers to some pre-processing of the code which allow to show which line of the code is executed as illustrated in two previous blog posts. library.getValue() is a method that returns the content of the library tab.